Getting things started here at The DIY Kitchen, I wanted to make something that seems pretty easy and many people use regularly. 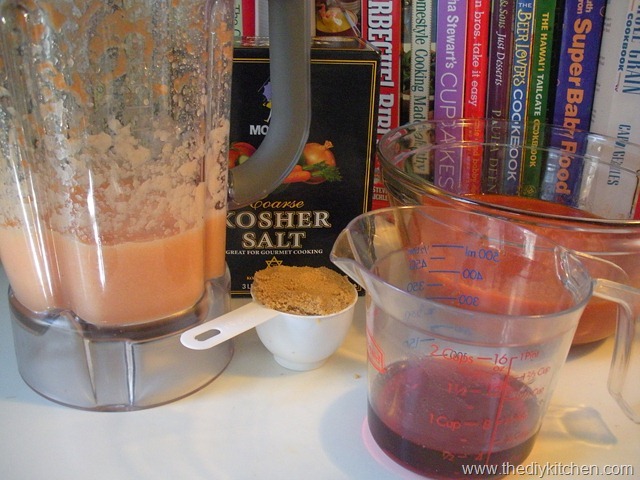 My son loves ketchup, but I’m not excited abut the high fructose corn syrup, so how about making at home using brown sugar instead. Using the recipe from Karen Solomon’s Jam It, Pickle It, Cure It: And Other Cooking Projects we use a variety of spices including stick cinnamon, bay leaves and star anise. I’m using store canned tomatoes (28 oz) for this first attempt but come late summer after the garden kicks out more tomatoes than one can possibly eat, I plan on using fresh or home canned for future batches. 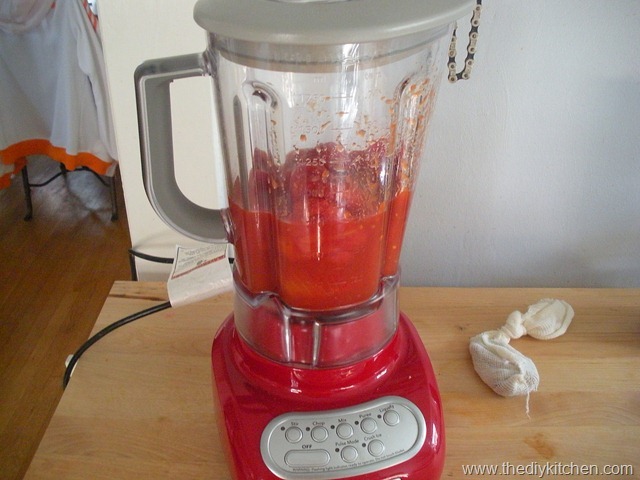 Start by pureeing the tomatoes and then set aside all but 1/4 cup (give or take). 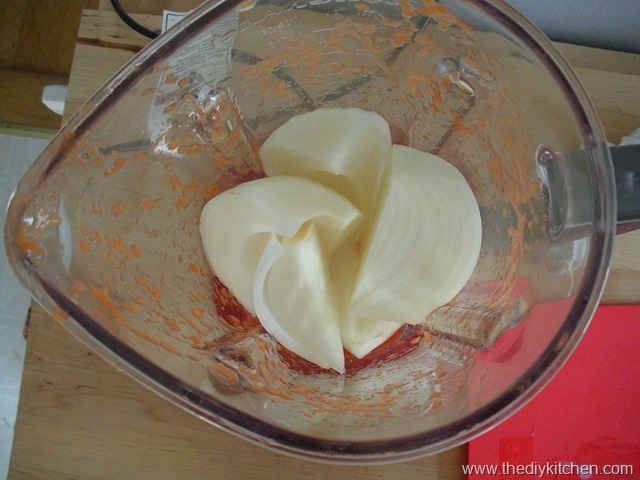 Add 1 quartered yellow onion and puree with the 1/4 cup tomatoes. In a large, non-reactive pot add 2 tbsp canola oil over medium heat and add onion puree and 2 tsp kosher salt. Stir the puree for 8 min. (or as long as you can stand being near this eye burning stage) reducing and lightly browning the onion. Next add the tomato puree, 1/3 cup brown sugar and 1/2 cup red wine vinegar and simmer uncovered for 15 minutes while occasionally stirring. (Note: the author uses champagne vinegar but I elected to use the red wine to save money). While your tomatoes are bubbling away, its time to make your spice packet. 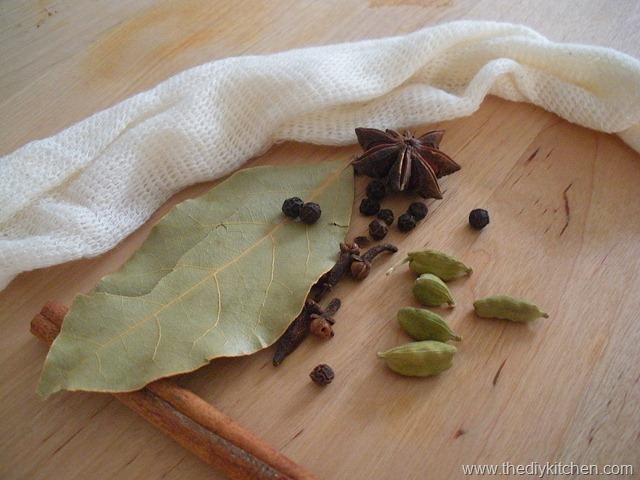 The recipe called for stick cinnamon, crushed cardamom pods, whole cloves, black peppercorn, star anise and bay leaf. I think it’s a great starting point, but feel free to experiment and use whatever spices interest you. I used a homebrewing hop bag, but making your own from cheesecloth works too. After 15 minutes, toss the spice packet in and simmer for another 10 – 12 minutes. By the time you’re done the volume should be reduced by roughly half. Remove from heat, add in 1 tsp of paprika (or more depending on your taste). Allow the mixture to cool, remove the spice packet, pour into a jar and you’re done. Should keep in the fridge for 2-3 months. Minus cleanup this shouldn’t take more than an hour to complete. In a side-by-side tasting, Heinz ketchup has a thick, almost glue-like consistency with a sharp, vinegar bite at the beginning that quickly fades. 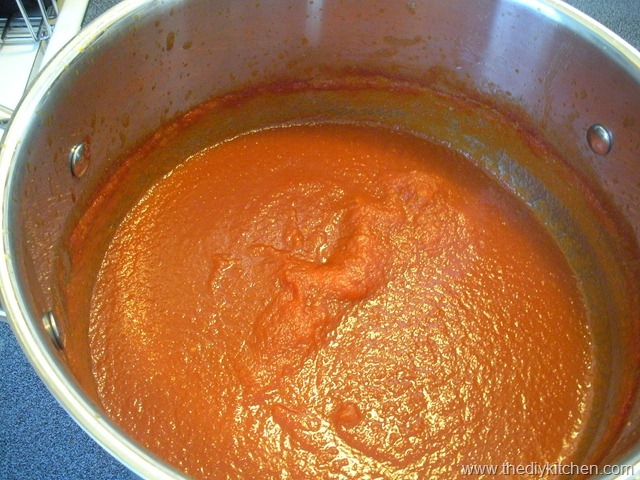 The homemade ketchup has a much sweeter aroma, thinner consistency, less bite at the initial taste with nicely integrated sweet and sour flavors that linger to an almost smoky finish. So there you go… The DIY Kitchen’s first entry. Let me know what you think regarding the content or the layout, whatever, I’m open to suggestions. so you’re not water bath processing it, just storing it in the fridge? Did your recipe say that’s okay? The Ball Blue Book scared the hell out of me re: botulism, with its YOUR VEGETABLES WILL KILL YOUR FAMILY warnings. Leah – In addition to the book indicating storing for months in the fridge, I did a little research on botulism. For botulism to grow it needs a low acid environment with no oxygen. 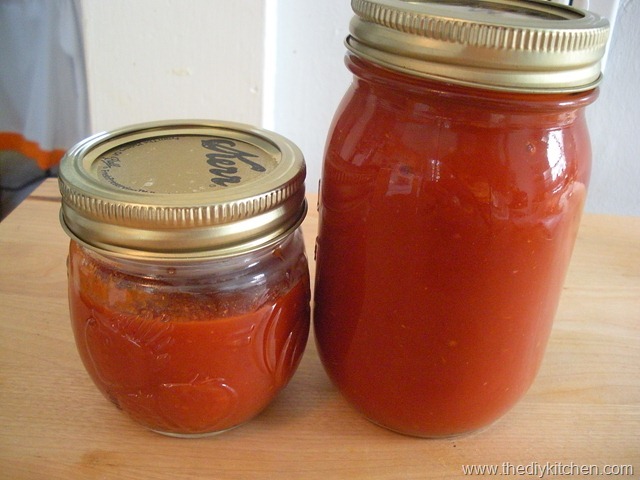 Tomatoes and vinegar should provide and acidic environment and by not canning, oxygen is present. Thanks for reading! SCIENCE! So cool. 🙂 And depending on how fast Adam eats up your ketchup, maybe spoilage isn’t a concern!